Custom chalk sets are nostalgic business gifts that will work for all types of businesses. As you already know chalks are the items that symbolize discipline and they shoulder great responsibility of leading a generation. You can invest in these promotional chalk sets to lead your campaign towards a bright culmination. Ideal for marketers targeting kids who can use these chalk sets during yard games, classroom games and hopscotch games. Avail these wholesale non-toxic chalk sets at attractive low prices at Promo4Kids.com. We will keep you covered with high quality products, lowest price match guarantee, 100% customer satisfaction guarantee, free online design proof and free artwork assistance. When young, most of us were warned against drawing on the walls and our actions were accompanied with great consequences. 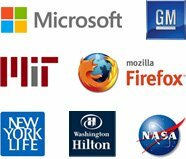 However, have you ever considered the possibilities of breaking this age old tradition for your benefits? If yes, these customized chalks are here. Chalks have high sentimental value in the lives of kids. They are used by teachers in classrooms to simplify lessons and they command respect and authority in all senses. This means your brand logo is going to receive respect when printed over these customized chalk sets. Custom Chalk Sets - Custom chalk sets are available in various packages and prices to suit your budget. You can easily select from two colors, three-color and multi-color chalk sets to match your promotional needs. Avail attractive price benefits on wholesale orders. For maximizing exposure, you can team these chalk sets with other writing instruments such as pens, crayons and coloring books. Custom Giant Chalks - Custom giant chalks will help a customer remember your brand information in a big way. 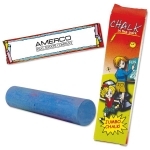 Giant chalks possess long shelf life and they will continue to remind your young customers why your brand is the best. Order these customized giant chalks before it rolls off our stock. Custom Jumbo Chalks - Custom jumbo chalks will make your branding efforts look big at small investment. These custom printed jumbo chalks are perfect to gift during tradeshows, business conventions, school events and child safety events. Place jumbo orders to make jumbo savings! Having kids around is so much fun but it takes lots of planning when you are shopping for them. Whether you are a new parent, kid-friendly advertiser or a new grandparent, we can help you with the popular promotional giveaways for kids at ProImprint.com. From piggy banks to Frisbees, you will get everything in between. We can keep you covered for all your kid's creative and entertainment requirements. 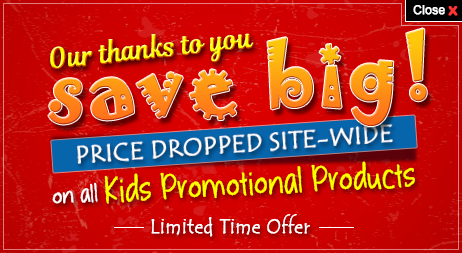 You can contact our customer service department at 855-454-3786 or you can write to us at info@promo4kids.com.